These image of Mercury by NASA's Messenger probe show the distinctive color of the planet's northern plains and their surrounding terrain. 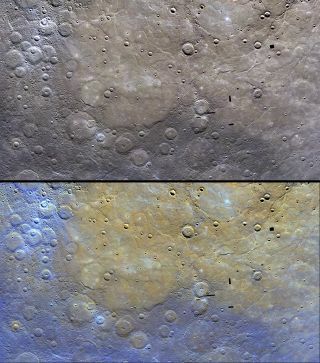 The top image is as Messenger saw the scene, with the bottom image enhanced to bring out features. Image released June 16, 2011. Mercury has a surface unlike any other planet's in the solar system, instead resembling a rare type of meteorite, researchers say. The finding, based on an analysis of data from NASA's Messenger probe, sheds new light on the formation and history of the mysterious innermost planet, scientists add. Mercury, the smallest planet in the solar system, is also one of the least understood, having received much less attention from scientific missions than Mars, Jupiter and Saturn. NASA set out to change that when it launched the Messenger probe a little more than eight years ago. Messenger became the first spacecraft to orbit Mercury. This view from NASA's Messenger spacecraft orbiting Mercury shows a region of smooth, volcanic plains that have been heavily modified by tectonic structures termed "wrinkle ridges," low, sinuous features that form when lavas cool and subside, causing the crust to contract horizontally. Image released Feb. 10, 2012. Lava plains are common in the solar system. For instance, young Mars spewed lava all across its surface, and it still has the largest volcano in the solar system: Olympus Mons is about 370 miles (600 km) in diameter, wide enough to cover the entire state of New Mexico, and 16 miles (25 km) high, three times taller than Mount Everest. Now, 205 measurements of Mercury's surface composition, made by the X-ray spectrometer onboard Messenger, reveal how much Mercury's surface differs from those of other planets in the solar system. "Being the closest planet to the sun does mean its formation history would be different and more extreme than the other terrestrial planets, with hotter temperatures and exposure to a stronger gravitational field," says lead study author Shoshana Weider, a planetary geologist at the Carnegie Institution of Washington. The surface is dominated by minerals high in magnesium and enriched in sulfur, making it similar to partially melted versions of an enstatite chondrite, a rare type of meteorite that formed at high temperatures in low-oxygen conditions in the inner solar system. "The similarity between the constituents of these meteorites and Mercury's surface leads us to believe that either Mercury formed via the accretion of materials somewhat like the enstatite chondrites, or that both enstatite chondrites and the Mercury precursors were built from common ancestors," Weider said. The researchers also looked at the areas around the northern volcanic plains. These surrounding locales are more pockmarked by craters, suggesting they are older, with more time spent getting scarred by meteor impacts. The older terrain possesses higher ratios of magnesium to silicon, sulfur to silicon and calcium to silicon than the northern plains do, but it also has lower ratios of aluminum to silicon. These differences suggest the smooth plains came from magma sources that were chemically different from the source of the material seen in the older regions. "The chemical differences between the northern plains and the surrounding areas, combined with the fact that the northern plains are younger by about 500 million years, tells us that the volcanic activity which produced the northern plains involved melting of different sections of Mercury's mantle, at cooler temperatures and at a later stage in the planet's history than the activity that would have produced the older surrounding terrains," Weider said. The scientists will detail their findings in an upcoming issue of the Journal of Geophysical Research-Planets.